Artist Elizabeth Tyler: One day to deadline! Now with only one day left to deadline for the W&N acrylic painting video competition my video about this painting in progress looks like it has a chance of actually winning! You can read more about it in my previous post. 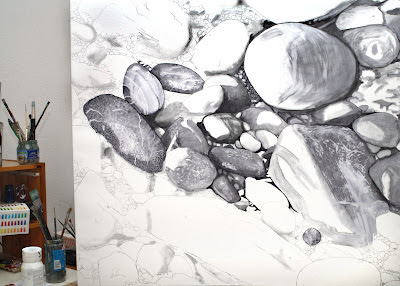 The technique I used in the video is called Grisaille, a method of painting in which full modelling is done in black and white (in this case Paynes grey) and then finished by adding transparent glazes in colour. Breaking the old rules of watercolour. Warning: competitions based on facebook "likes"